Technology is moving fast with more and more power efficient silicon being designed and manufactured as a benefit to both manufacturers and end consumers. Especially for gaming segment that requires intensive graphics processing with tendency of overheating, it is crucial to have a thermally efficient processor in place to further enhance its reliability. Good news for Sony’s gaming console fans now, the famous Japanese console maker has recently announced a new GPU redesign with fabrication technology of 40nm targeted for next generation gaming console. As compared to current PS3 Slim console’s processor that stays at 65nm, this is no doubt a huge improvement with obvious benefits for all. First of all, a 40nm process technology RSX GPU will be much thermally and power efficient as compared to previous, which will definitely able to simplify the thermal design with less cooling mechanism, fanless and potentially slimmer form factor design. The new board, codenamed as CECH-2100A has been spotted with few changes as compared to CECH-2000A (PS3 Slim version with 65nm GPU), particularly surrounding heat sink design as well as lighter power supply requirement. More importantly, the smaller process technology design contributes to much cheaper processor cost, not to mention about lesser discrete components which results in total BOM (Bill of Material) cost reduction significantly while still prolong the end product life time and reliability. 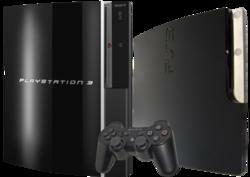 Even though its thermal dissipation is still far high especially when comparing to Nintendo Wii due to more powerful and sophisticated GPU, but this transition will be able to at least reduce PS3 slim cost to continue stay competitively in gaming segment.